As the power of the New Order grows, so too does the number of Code-compliant miners. Thousands of highsec miners own permits. The rebels don't like this, so when they encounter permit-owners, they encourage their fellow miners to forsake the Code. For the rebels, it's not about shutting off a revenue stream to the New Order; they're worried about our regime taking root and gaining legitimacy. Though rebels often float the idea of ganking permit-owners, it's far too much effort. They attempt to use peer pressure instead. 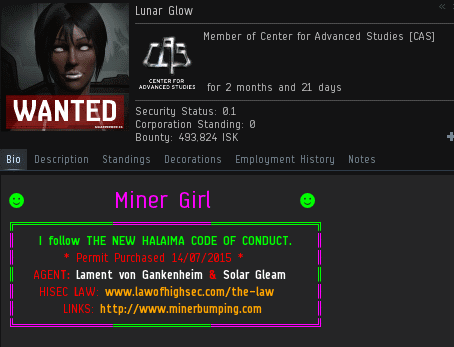 Roniin Makami came across Lunar Glow, a proud, permit-carrying miner. He was so outraged by her bio that he invited her to a private convo to talk about it. Roniin made some standard rebel arguments for not buying a permit. First, he asserted that permit-owners are targeted by the very Agents who sell them permits. Second, he hinted that permits aren't worth it due to all of the miner gankers unaffiliated with the Order. In truth, the New Order is responsible for nearly all miner ganks in highsec. After the great barge buff of 2012, miner ganking shrank to almost zero. We brought it back. And everyone knows that our gankers prefer to shoot rebels over permit-owners. Roniin's ignorance showed. Mining permits cost the same today as they always have. They're ridiculously affordable. Roniin's bragging about "due diligence" didn't last very long. Almost immediately, he admitted that he AFK mines all the time. In fact, Roniin greatly enjoys AFK mining. It didn't take much to get him talking about all the things he loves about it. 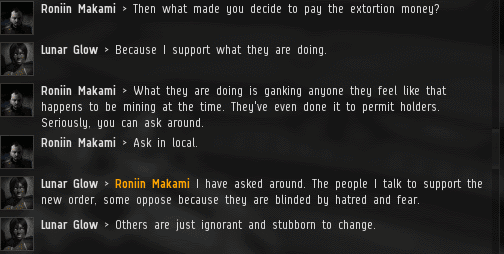 An irony presented itself: Roniin insisted that if Lunar Glow simply asked in local, she would hear all about how permit-owners get ganked. Yet Roniin himself was speaking to a permit-owner who said otherwise. Roniin dismissed Lunar Glow's positive experiences with the New Order. She was only a newbie, Roniin said. Not a highsec expert like himself. Lunar Glow did something shocking, something Roniin could never have expected: She asked for evidence. In theory, if hundreds of mean ol' New Order Agents are running amok across highsec, behaving in an unseemly manner, there should be plenty of proof. EVE players automatically log such evidence. Unfortunately, Roniin couldn't find any. His logs showed nothing. Since he didn't have any logs to present, Roniin urged Lunar to listen to what people were saying about the New Order. He couldn't direct her to anyone in particular, other than himself. Lunar replied that she'd seen plenty of evidence of what really goes on in highsec on MinerBumping. However, Roniin was afraid to visit the blog. Everyone who reads it gets a computer virus. On an unrelated note: Dear reader, you may have already won a free iPad. Would you like to know more? Deeply frustrated by his inability to persuade Lunar to burn her mining permit, Roniin parted ways with her. He accused Lunar of being blind and ignorant and inexperienced--and that she knew too much. Carebear logic. Lunar Glow promptly reported Roniin to the authorities. He'd confessed to AFK mining, after all. Although Roniin said he could never be ganked by the New Order, an Agent was dispatched and he met his fate within a few hours. That's the problem with rebel miners trying to use peer pressure. They're not peers at all. Gallant miners are plainly superior. Now that was inspiring. I always love how we are called "bullies" and how we apparently spew hatred in local, yet when asked to provide proof of our so-called transgressions the carebears cannot. Because said evidence doesn't exist. We aren't the problem, we're the solution. BTW Savior, what can you tell me about that iPad? Changing the culture of highsec is progressing on schedule. Where to send my personal info for the iPad James? Lunar Glow, Solar Gleam. Do you think they might know each other? Yes. She is my sister. I have met many brothers and sisters in my New Order family. A family that lives by the Code is a family with unbreakable bonds. Lenda and I admire your dedication to what is right. Excellent narrative. The carebears haven't a single argument that can't be shot down in a trice by an astute Agent like Lunar Glow. So faction welfare farmer turns to AFK mining in "his spare time". You really could not make it up. That permit is stylish. If only all miners made their permits look that cool. squee! Hilarious episode, and we didn't even have to wait through a 'to be continued...' to see the killmail! Lunar Glow / Solar Gleam. That fool didn't realize he was talking to a CODE alt RPing as a compliant miner. Looks compliant to me! Truly you can stand head and shoulders above the average miner due to your actions. Keep fighting the good fight! Please note many miners are happy to be code compliant. 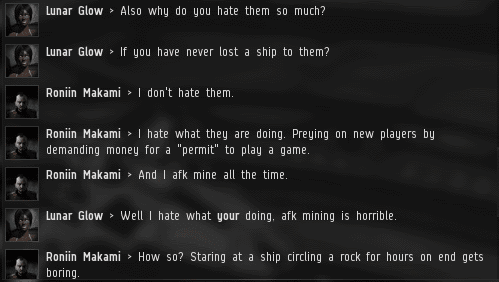 They actually find the role playing aspect of this adds to the fun of mining. I have mined in eve on my accounts, since 2008, but each account then spreads out into other aspects of eve game play. It so happens that on this toon, I made the 315 miner corp. The aspect of doing this was to take what code taught on ganking, so I could also help eradicate bot miners ( who take from the game, while putting nothing in the game) And along the way I have made many friends, covering all aspects of the game. I've been a permit holder for almost a year and half. No Agent has ever had a problem with me as I follow the CODE. The silver lining of following the CODE is random ganks never expect an alert and tanked mining vessel. If they want my ship, they better bring at least 3 or four decent players. If they kill me, they earned it! In reality, Hulkageddon was the best thing that ever happened to high sec miners. Remember when trit was barely hitting 3 ISK a unit? I do. Keep up the fine work Agents! Nailed it. If you're following The Code, gankers won't stand a chance against you. You'll be aligned out, tanked, alert, and proactively looking for gankers. Phew. These past few articles have been somewhat devoid of tears. I was beginning to fear that the well had dried up! Angry miners in the comment section are half of the Minerbumping™ experience! "Yes. I watch local. I practice due diligence.And i flat-out ignore CODE." A small error in carebear logic.